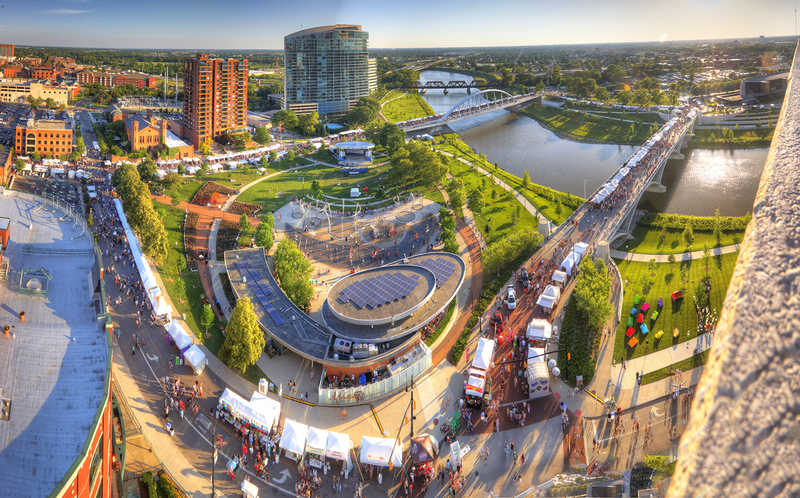 The Columbus Arts Festival, produced by the Greater Columbus Arts Council and presented by American Electric Power, returns to Columbus’ downtown riverfront June 8-10. More than 270 local, national and international artists will exhibit their work, while six stages host a variety of free music, dance, theater and spoken word performances. Friday evening the Festival welcomes Scott Bradlee’s Postmodern Jukebox presented by Worthington Industries on the ABC6 Bicentennial Park Stage, while on Saturday, G. Love & Special Sauce, presented by CoverMyMeds, brings new music and 90s favorites. The new Genoa Park Stage presented by Huntington takes advantage of the amphitheater created by the stairs on the west bank of the Scioto, and will feature more than 20 performances throughout the weekend. There are plenty of interactive opportunities for people of all ages, from demos by local creative groups at the Big Local Art Tent or hands-on art experiences at the Activities Village next to the new Scioto Peninsula Park by COSI. Get a new view of the Festival and the Columbus city skyline by renting a canoe or kayak and paddling on the Scioto River for Riverfest, running Saturday and Sunday. Festival guests will find it easier to navigate the Festival using the new downloadable app, complete with an interactive map, schedules, a directory of artists and much more. This year the opening night Patron Party at the Cultural Arts Center is now open to the public! Ticket sales to the party, sponsored by The Ohio State University, are available online through the Arts Festival website, and will be used to fund artist awards, which the Festival doubled this year. Food trucks, drink vendors and a new local craft beer garden round out the experience for guests visiting Columbus’ favorite “welcome-to-summer” event!